The Wusthof Classic Ikon 6 inch utility knife has a thin, slightly flexible blade. Use if, certainly for making sandwiches, but also as a utility knife, for slicing and carving. In in pinch, because the blade is so sharp, you can even use it to slice pickles and tomatoes for sandwiches. 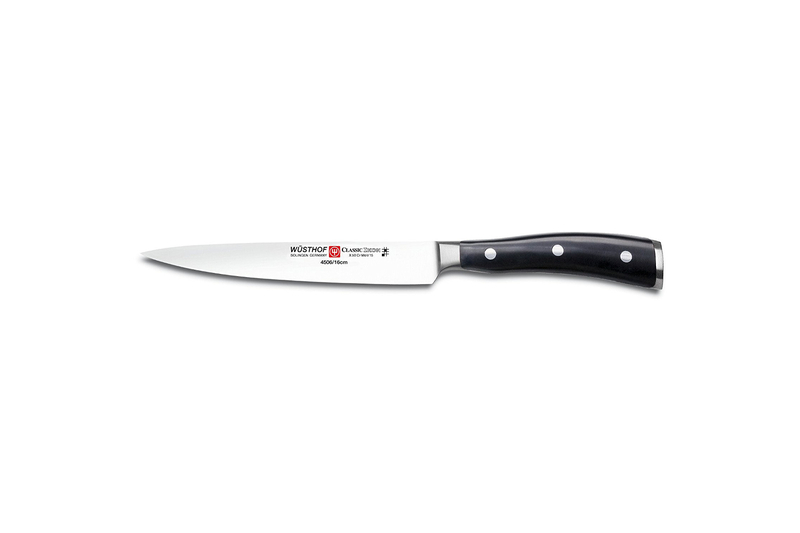 This multi-use knife is made with German stainless steel in Germany. You'll appreciate its sharpness as well as durability, backed by a lifetime guarantee from Wusthof. A combination of a long lasting, razor sharp blade and contoured ergonomic handle makes Wusthof Classic Ikon cutlery the best knife style Wusthof makes. Amazing precision and control comes from unbeatable sharpness and a curved handle that comfortably fits your hand. Knife will remain sharp longer than many other knives because blade is made from Wusthof-specifiied super strong stainless steel. Attractive wood grain design on the stain-resistant polypropylene handle so Classic Ikon will always look good in your knife block! Specially designed bolster adds to comfortable cutting and a firmer grip. 30% sharper and will last 40% longer than ever before, thanks to the latest Wusthof Precision Edge Technology, PEtec. This knife has an extra sharp 28 degree angle.